Many paleontologists are very interested in living groups, because the study of the living organisms can both unlock their evolutionary history and provide important keys towards interpreting their fossil record. Some living groups have ancient histories. For example, sharks have existed as a group for over 350 million years! Today, sharks and rays (elasmobranchs) are represented by over 600 species that show a remarkable range of ecological and morphological diversity. Unlike the true fishes, sharks do not have internal bone, but instead have a cartilaginous skeleton. Although many people are told that sharks are primitive in comparison to other groups, this is not true. Many sharks are efficient and specialized hunters that have thrived for millions of years. This small exhibit shows an amazing predator: the great white shark (Carcharodon carcharias). The white shark is found in temperate waters throughout the world's oceans, and it is an important, though not common, predator in California's coastal habitats. Scientists from several organizations throughout California including the Point Reyes Bird Observatory, the Marine Mammal Center, the California Academy of Sciences, Bodega Bay Marine Laboratory, California Department of Fish and Game, and the Museum of Vertebrate Zoology at UC Berkeley, have been studying white sharks and their prey for several years in hopes to better understand their behavior and ecology. White sharks are predatory animals that begin life by feeding on fish, rays, and other sharks, and as they grow, switch to feeding on marine mammals and scavenging on large animal carcasses. Their first mammalian prey are usually the small harbor seal, but as the sharks increase in size, they become large enough to eat sea lions, elephant seals, and small toothed whales. Attack strategy consists of a swift, surprise attack from below, inflicting a large, potentially fatal bite. 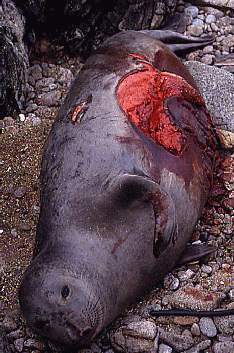 The pinniped often dies from massive trauma or blood loss, but the bites may be superficial or misplaced on the body, allowing the seal to escape and survive the attacks with their scars as witness. Large white sharks will also scavenge on the carcasses of whale sharks, and on the fat-rich blubber layer of dead whales. They will occasionally feed on sea turtles and sea otters, and are known to attack, but not eat, humans. The waters off central California offer a rich bounty of food for white sharks, and every summer and fall they actively feed in nearshore areas. The Farallon Islands, a national wildlife refuge about 27 miles off San Francisco, is a common feeding ground for the sharks. Four species of pinnipeds, the northern elephant seal, the California sea lion, the Steller sea lion, and the harbor seal, live around and breed on these islands, making a plentiful food resource for the white sharks. The coastal waters along central California, especially around the Año Nuevo State Reserve and along the Marin Headlands, is another common feeding area for the sharks. In the summer the sharks feed on seals and sea lions along the coast as far north as Oregon and occasionally the Gulf of Alaska, and in the Fall, they turn south and feed along the offshore islands. It is believed that female white sharks migrate to southern California to give live birth to their offspring. In abnormally warm-water (El Niño) years, white sharks are more plentiful off central California because both they, and their prey, are shifted north. The years 1984-84 and 1991-92 show high trends in white shark predatory activity, and were the warmest oceanic seasons in recent history. Media sensationalism and widespread ignorance has given the white shark a bad rap. Although the species is responsible for an average of 2-3 non-fatal attacks on swimmers, surfers, and divers each year, its role as a menace is exaggerated; more people are killed in the U.S. each year by dogs than have been killed by white sharks in the last 100 years. Additionally, scientific studies show that population of white sharks is low, with perhaps fewer than 100 adult animals in the state's waters. White sharks are important predators in the marine ecosystems of the California coast, and the people of California recognize that. In 1992, the white shark was placed on the protected species list for the state of California, and is legally protected from unlawful killing or exploitation. The original bill was supported by both scientists and fishing organizations, surfing clubs and diving groups, private citizens and an array of government organizations. With your support and respect, we can continue to live with this complex and misunderstood animal. Studying the white shark requires the use of media equipment. The 10 images above were acquired during a pilot project run at the University of California Museum of Paleontology, the Department of Integrative Biology, and the Point Reyes Bird Observatory. Dr. Douglas Long has been doing research on the ecological interactions, in particular the feeding habits and predatory behavior of great white sharks on marine mammals along the coast of central California for several years now. His research has included autopsying dead marine mammals, studying the feeding behavior of sharks, and trying to estimate shark population size. These images are directly related to the latter two aspects of his research. From a post on the Farallon Islands, researchers watch the waters for injured marine mammals and signs of sharks feeding. When they spot a feeding shark, they travel in a small boat to the site, and when the shark comes close they stick a small hand-held waterproof video recorder under the water and film the shark as it passes by. The sharks are identified by characteristic marks like scars and skin blemishes. Most of the pictures at the end of this exhibit were taken with the express intent of looking for these scars, so they may not be the most aesthetic images possible. However, they are the most useful. The ability to visually identify sharks allows researchers to tell more about migration, ranges, and the number of individual sharks in the area. Douglas believes that there are a suprisingly small number of individual sharks off the California coast, and that they have larger ranges than previously thought. Douglas Long, a graduate of the Department of Integrative Biology now at the California Academy of Sciences and the Department of Biology at St. Mary's College in Moraga, has graciously made these images available. PLEASE DO NOT REPRODUCE WITHOUT PERMISSION FROM THE PHOTOGRAPHER.